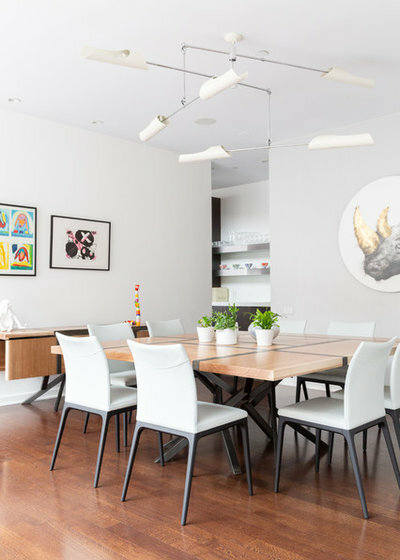 Homeowner Ruth Blatt teamed up with interior designer Mika Wegner Avni to refresh her family’s 2008 three-story house in Chicago’s Roscoe Village neighborhood. 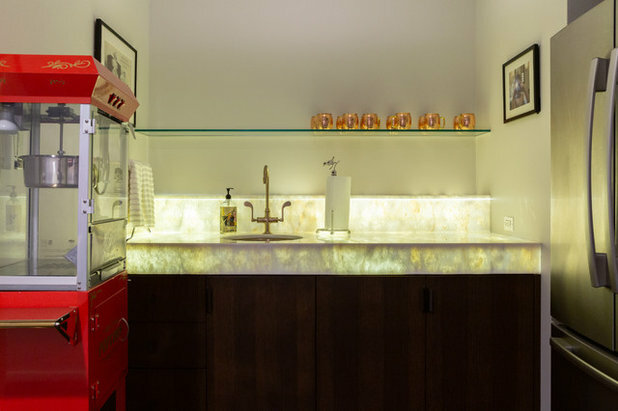 Blatt wanted to create a space that reflected the family’s personality while meeting everyone’s individual needs. 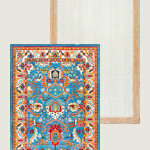 With Blatt’s love of art and whimsy and Avni’s skill at mixing design styles, it was a perfect match. 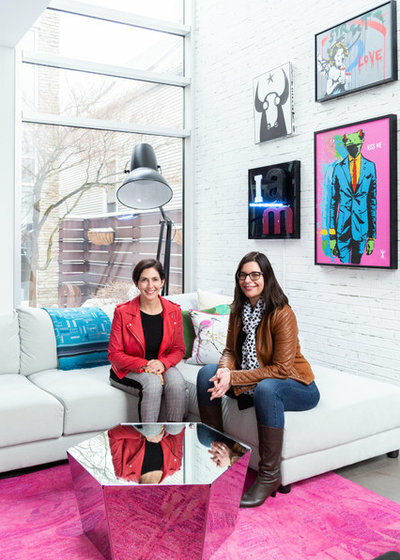 “What started as a design job turned into friendship for life,” Avni says. 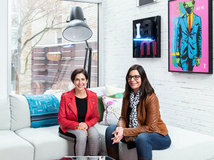 Blatt, left, and Avni, right, sit in the redone family room. 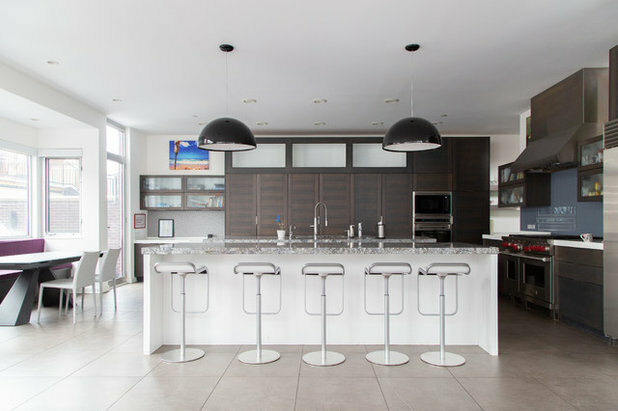 Avni says her design for the home was inspired by the family’s love of modern art, literature and entertaining. Essential elements slated for redesign were a library room to showcase the family’s book collection, a dining room with a large table that could seat at least 12, and “a family room that would be their happy place — a colorful and joyful space where they can hang out as a family and enjoy their time together,” the designer says. 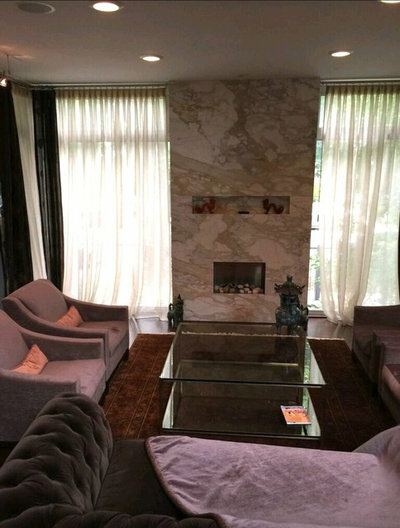 In the original family room, a television was the wall’s centerpiece. 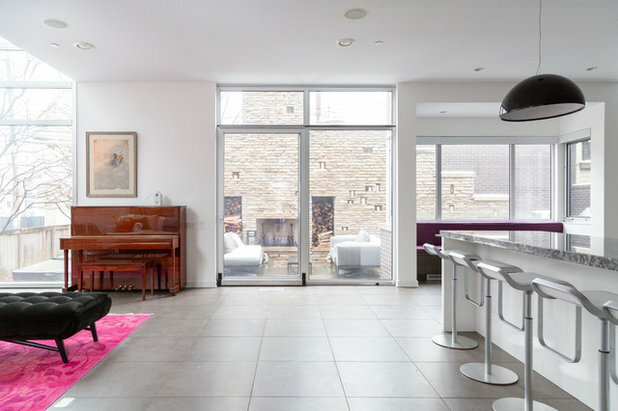 “So instead of arranging the furniture to face the fireplace wall, which would have put a barrier to the kitchen, we arranged the sectional to face the backyard and the kitchen, thereby integrating the space,” Blatt says. The family room exemplifies Avni’s trademark mix of styles, pairing modern art with a Victorian-style chair and contemporary coffee tables. 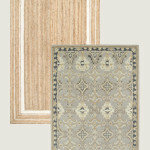 Blatt says each piece of art in the home has a story behind it. Most were acquired on trips abroad, and many of the artists are personal friends, which makes her treasure the works that much more. “Acquiring art is like falling in love. First there is attraction and desire, then commitment, finally cohabitation,” Blatt says. The big blue painting seen here is by Israeli artist Bazooka Joe. Several of the other pieces are from a graffiti artist and from Blatt’s friend Lindsey Liss. 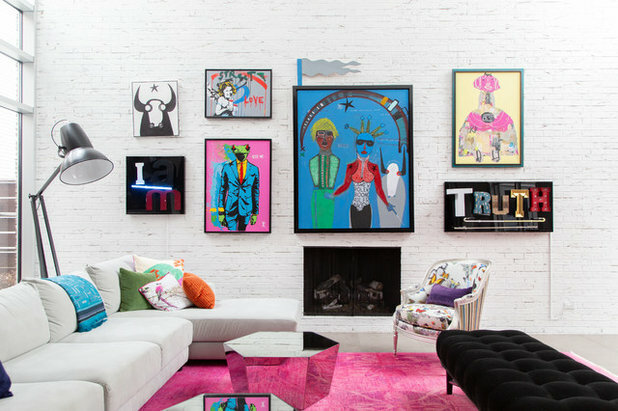 The art inspired the color choices in the space, including the fuchsia area rug. The original brown brick wall was painted white to act as a canvas for the art. 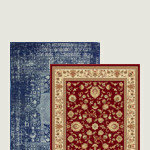 To balance all the color, Blatt and Avni chose a neutral tone for the sectional. 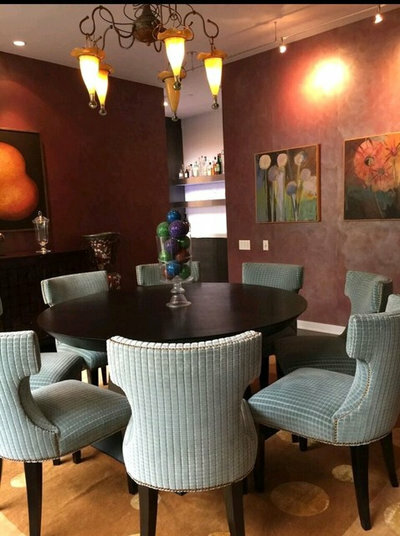 “We then started gradually adding pops of color, first the rug and art, then accent chairs and pillows, until the balance seemed right. It was an iterative process,” Blatt says. 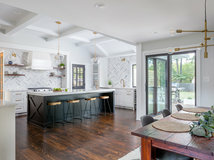 The kitchen received just a few design changes, including new pendant lights over the island and a new bench cushion for the breakfast nook. Blatt says the kitchen table is one of her favorite places to work because of the light and space. 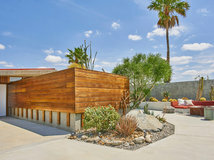 Sliding glass doors bring in plenty of light and provide a view to the back patio, with its existing fireplace and new patio furniture, landscaping and hot tub. The piano adds a classic element to the space, Avni says. Blatt, a writer and activist, is seen here relaxing with the family’s fox red Labrador retriever, Edgy. 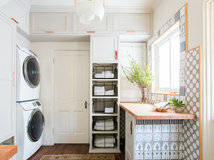 Blatt works almost exclusively at home, so it was important for her to have a space where she could be comfortable, creative and productive, as well as accommodate guests. After: The room indeed became brighter, which proved a challenge since the space also serves as a library, a room that’s often relatively dim. “I think we were able to create the coziness of a library while enjoying the benefit of large windows and plenty of light,” Blatt says. 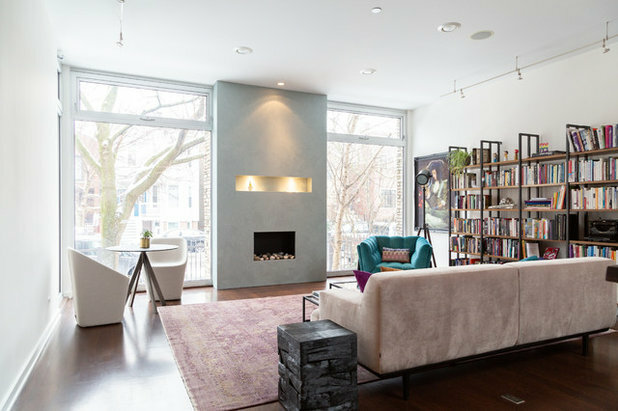 Avni divided the space into several sitting areas: “A velvet teal accent chair for comfortable reading, a cafe table with two side chairs for a private conversation or studying, and an area for socializing, with a large, comfortable sofa,” she says. 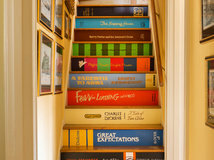 A stairway leads from the main level to bedrooms upstairs. 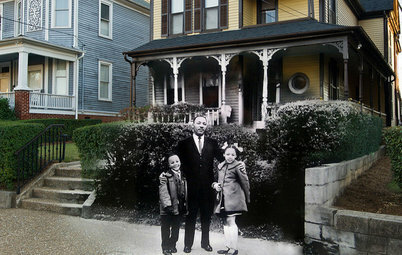 The painting in the stairway is an example of how location affects where Blatt hangs art. 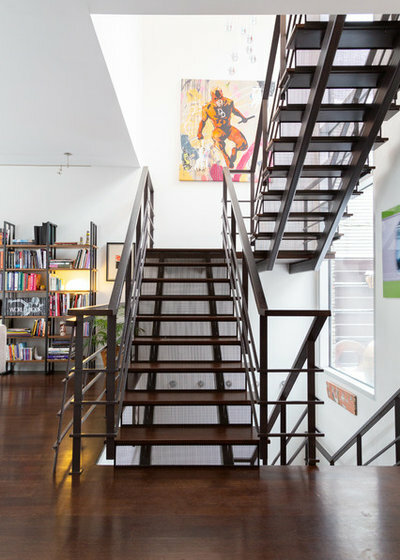 “Art in hallways and staircases is art that I see while in movement, whereas art facing seating is art that I view while stationary, so it will be art that keeps drawing me in, or, as in the family room and dining room, a gallery wall of pieces that interact with each other,” she says. A bookcase in the library area of the living room measures 12 feet wide by 8 feet tall and holds the family’s large collection of books. 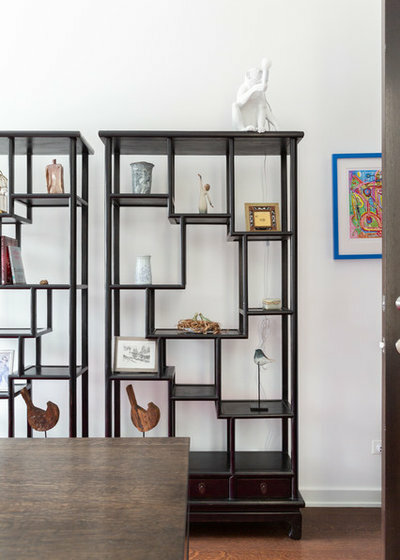 The custom bookcase was made by Chicago furniture designer Jacob Wener of Modern Industry, in collaboration with The Golden Triangle, a store in Chicago that sells antique Asian and European pieces. 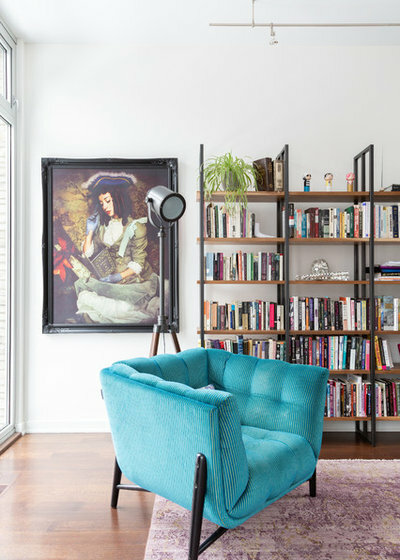 A velvet teal accent chair with a photographer’s tripod floor lamp behind it makes for a cozy reading space. 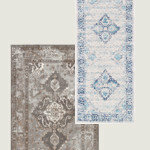 Tips for using art: Always display pieces you love, and pay attention to scale and proportion, Avni says. “Go with pieces that speak to you, create an emotional reaction and, just like your home interior, are an expression of you,” she adds. 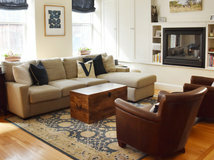 Keep the art at eye level, and its size should equal one-half to two-thirds the width of the furniture it sits above. 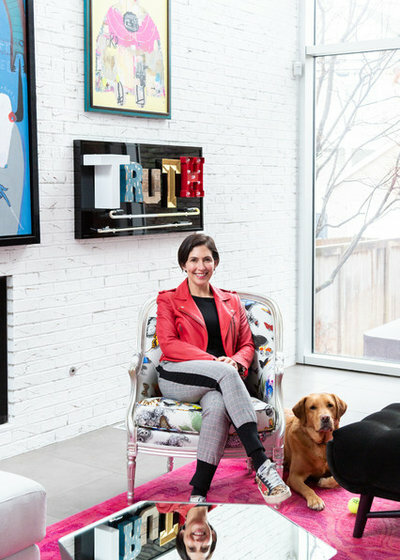 “The art should be connected to the rest of the space, as it is part of the overall decor,” Avni says. 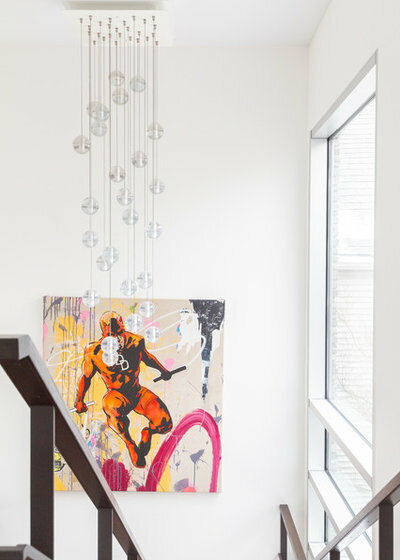 A unique art piece is featured in the home’s entryway: a lenticular print that changes as the viewer moves. It toggles between a portrait of John F. Kennedy and the words “Happy Birthday” and an image of Marilyn Monroe. Blatt likes the humor and irreverence it evokes. “We love that piece and we think it is great for the entry because it sets the tone for the house,” she says. Before: Though well-lit, the dining room previously featured dark tones on the walls, floor and furnishings. After: Here’s the new lighter, brighter space. 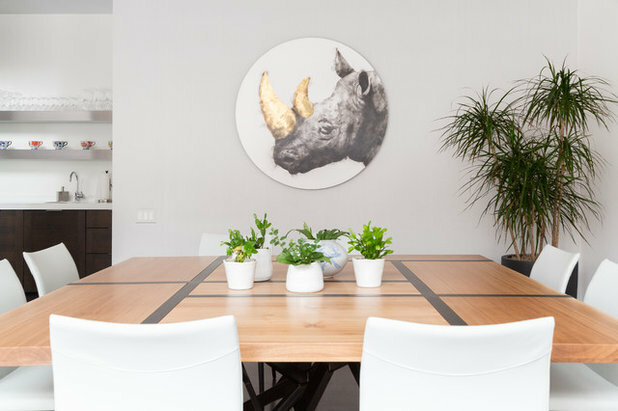 A large round painting of a rhinoceros is a focal point in the dining room, which “breaks the squareness of the room and adds some humor to the space,” Avni says. The custom table was made to fit the room and includes leaves that extend to accommodate large parties. The chairs were imported from Italy. The mobile chandelier is from the owners’ previous home. 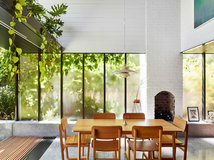 Blatt says they wanted there to be plenty to look at without being overwhelming, while connecting the space to adjacent rooms and the outdoors. 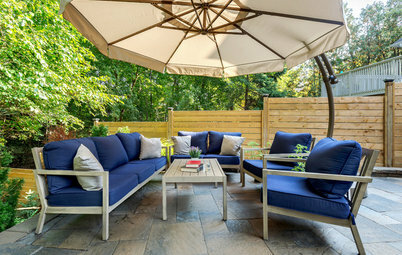 “We wanted a room that was more earthy to echo the trees, flowers and bushes in the courtyard that it looks upon and that connected the muted colors of the library to the bright and playful family room,” she says. The bubble chandelier in the stairway was already there. 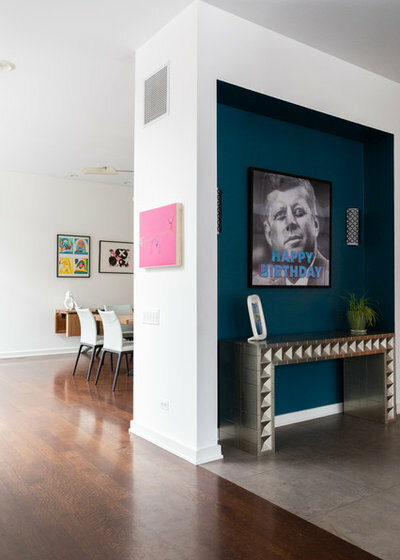 The painting by Chicago artist Erik DeBat, titled “Dare Devil,” was a 40th birthday present from Blatt to her husband. “We love the energy of that piece,” she says. 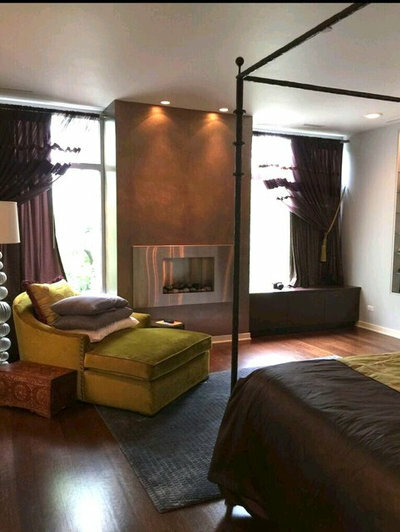 Before: In the master bedroom, curtains and dark tones dominated the existing decor. 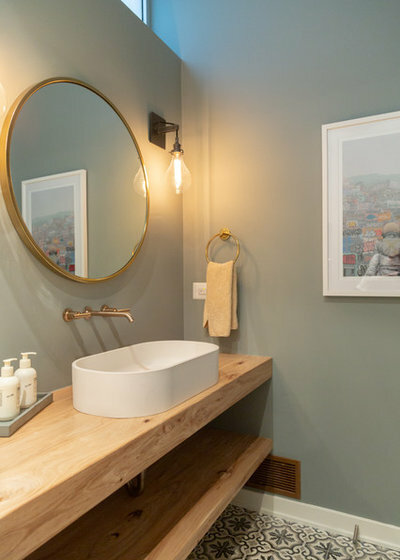 After: Blatt was seeking a quiet and calm atmosphere in the bedroom, which is now bathed in white, from the painted walls to the cloud sofa and textured mural wallpaper. “We knew we wanted a haven without the intense colors of the main floors,” Blatt says. 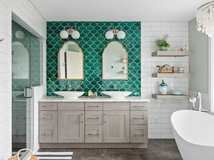 She saw the combination of wallpaper, rug and pendant light in a Mineheart catalog, with its creative and whimsical furnishings. “The wallpaper felt like a risk — what if I get sick of it? — but I had fallen in love so that was that,” she says. Over the fireplace, the four images of rabbits by artist Hunt Slonem add pops of color. 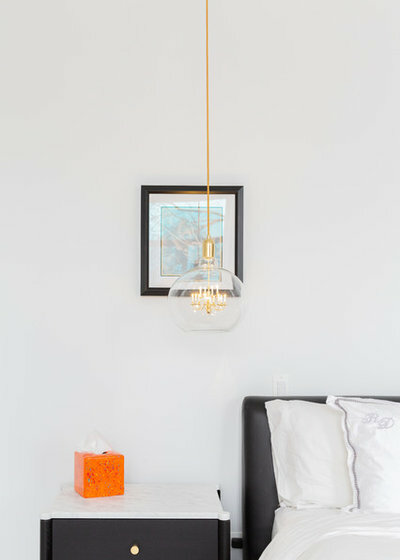 A miniature gold chandelier inside the Mineheart King Edison pendant light adds another touch of whimsy to the master bedroom. 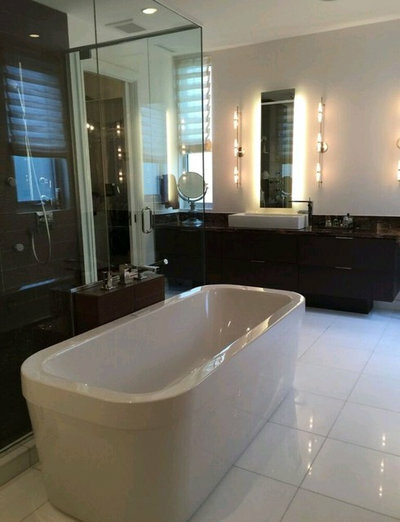 Before: The previous master bathroom had several dark-colored elements. The closets adjacent to the master bath are original. “It is great having so much space because I can see what I have,” Blatt says. 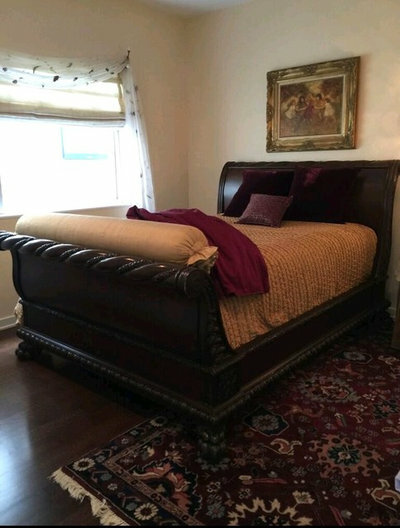 Before: A dark sleigh-style bed was part of the existing guest room used for kids’ sleepovers. 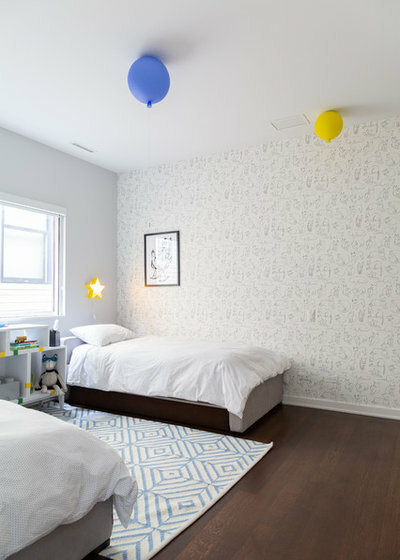 After: The kids’ guest bedroom was freshened up with a fun wallpaper and lighting that looks like balloons. 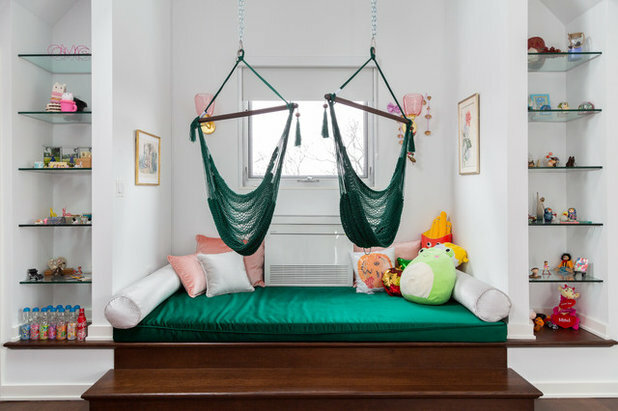 “I asked Mika to design a children’s room that is gender-neutral and soothing, because the children that will be sleeping in it will be away from home. I think she did an amazing job,” Blatt says. 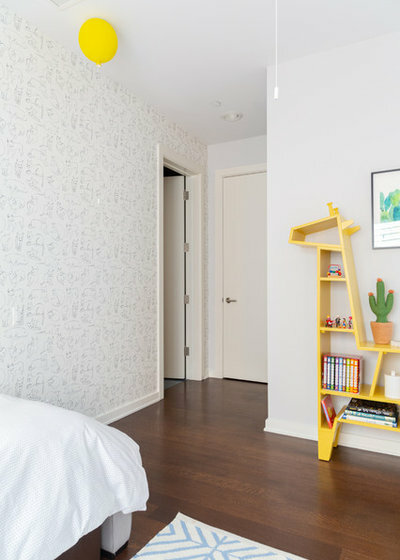 The room includes a cute yellow giraffe-shaped bookcase. 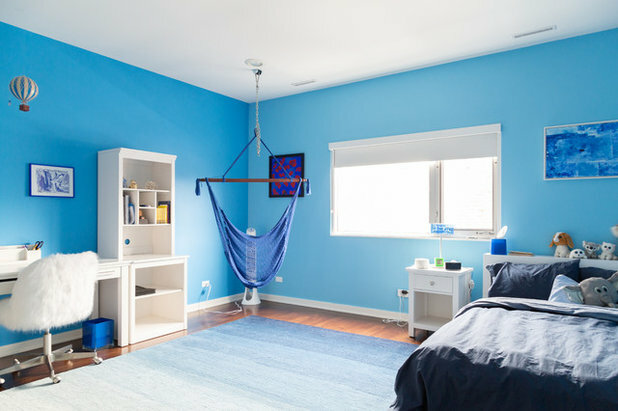 Blatt says her son designed his own bedroom, choosing blue ombre as the dominant color. 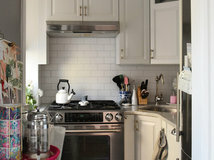 Benjamin Moore’s Aquarius and Bayberry Blue were used. The room includes a white desk with plenty of storage and a comfy faux fur chair. The rope hammock swing adds another fun seating option. This is the younger daughter’s room, which she liked as is when the family moved in. 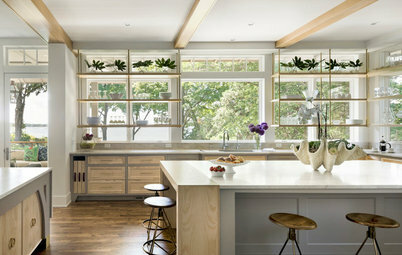 It received new window treatments and a custom purple cushion on the window seat, which has drawers for storage. 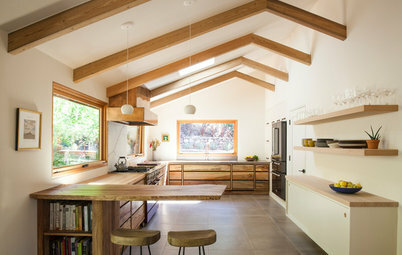 This bright room is a multiuse studio space for the kids to do crafts and homework. 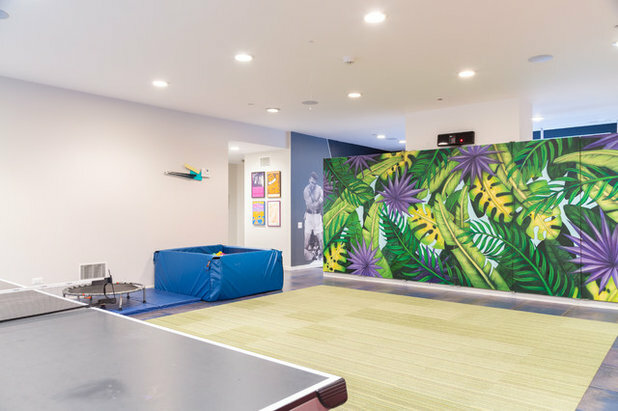 “We wanted our home to be the gathering place for our children’s friends, and this room is a big attraction,” Blatt says. “It’s also nice that there is a space in the home where they can safely make a mess.” She notes that slime making is popular these days. The older daughter’s room reflects her personality and is a place for her collection of miniatures from various trips abroad. “It has a timeless bohemian vibe, as well as showcasing her interest in Japanese animation, superhero movies, musicals and art,” Blatt says. The daughter’s collection extends to the fabric headboard. 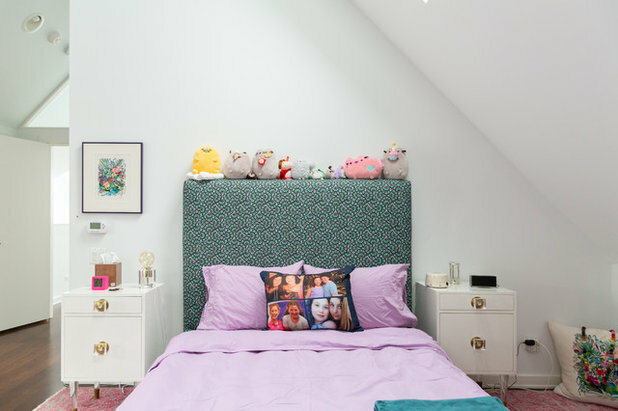 “She has very eclectic interests and her room reflects that,” Blatt says. 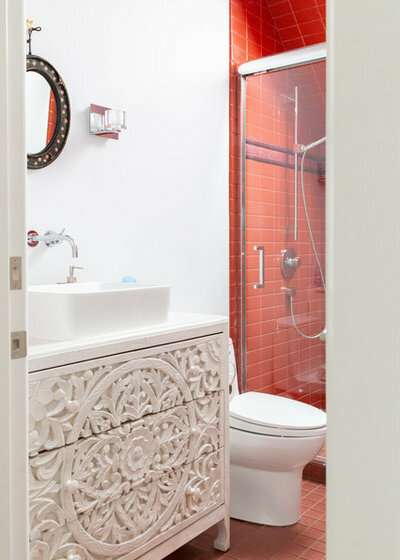 The older daughter’s bathroom has original red-orange tile and a mango wood whitewashed dresser-turned-vanity. The homeowners had their entire multiuse basement repainted. Chicago artist Lisa Gray painted the purple flower mural outside the window. “I liked it so much I asked her to paint the jungle mural on the room divider in the style of Henri Rousseau,” Blatt says. That mural is shown in the next photo. Here’s a closer look at the jungle mural painted by Lisa Gray. Blatt does most of her exercising at home, so she wanted space for yoga, as well as a fully equipped gym for boxing, cardio and weight training. 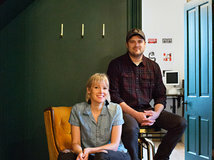 Artist Brian Keller, the fiance of artist Gray, painted the gym mural. 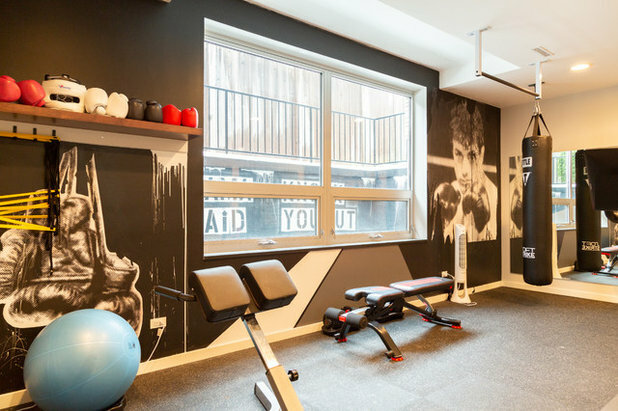 “We came up with a gym design that was edgy but whimsical and reflected our love for boxing. It came out perfect. There is no other gym like it,” Blatt says. The office contains a Chinese bookcase from The Golden Triangle that holds some of Blatt’s favorite objects, mostly pottery pieces made by her sister. LOVE the light fixture with the tiny chandelier inside! It made me smile! 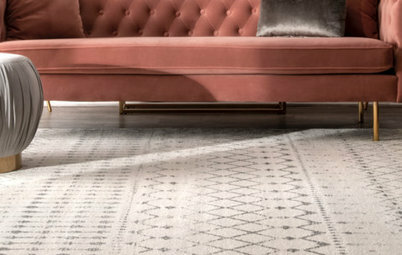 Love that pink rug ! Never seen a house where it works as well as here . The entire makeover is brilliant !!!! 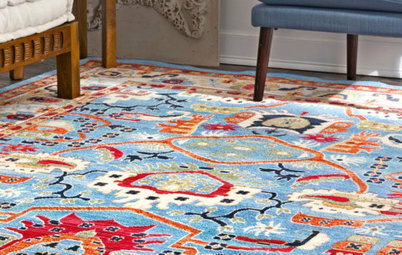 Beautiful and colorful design! 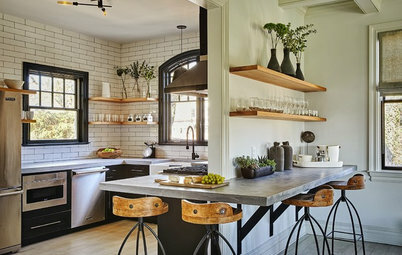 It is such a great example of how art can make a space wonderfully unique! 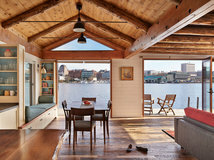 And I am delighted to see that so many artists have contributed to make this home truly special for the owners. Also, totally agree with the designer's comment “The art should be connected to the rest of the space, as it is part of the overall decor”.